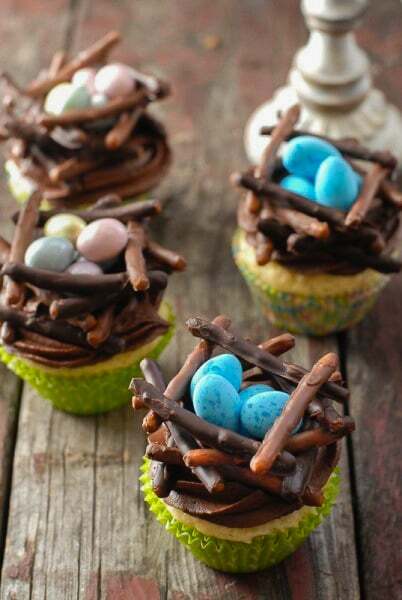 Making Easter cupcakes is always fun but none are more well-loved than Chocolate Bird’s Nest Cupcakes. Part recipe, part craft project, these chocolate coated pretzel nests filled with candy are a delight for all! Gluten-free and gluten instructions. Last year before Easter I stumbled upon these perfect blue eggs. Hard coated chocolate with caramel in the middle; but I did not even care about that part. I’d never seen a confection in this hue. A gorgeous matte, mottled deep sky blue. I had to have them and bought them for family Easter baskets. 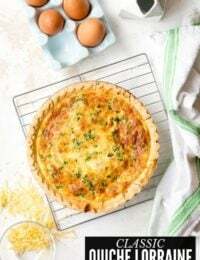 I’ve not forgotten those eggs and in the back of my mind have been plotting for the last year about folding them into a recipe in a way that lets their unique beauty shine. 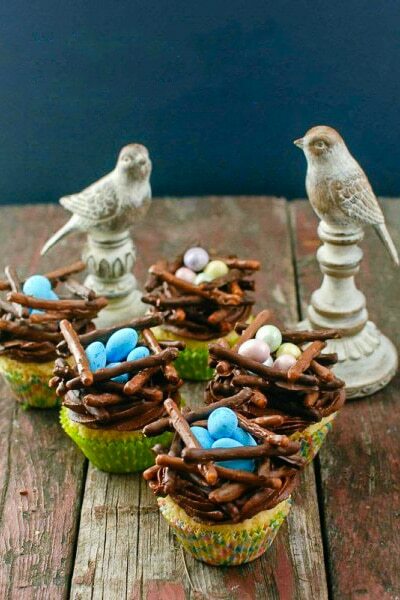 As the season turns toward spring the idea of an edible nest came to mind but I wanted to perch it on Easter cupcakes. I began to mentally engineer a method to create a nest, which had to be gluten-free, and then to experiment in the kitchen. It was about this time that I realized I had no idea where I’d found the eggs last year. I knew they were a more boutique product that I had not found them in a mainstream store. Then as luck (or serendipity) will have it I had an errand in a local independent pharmacy where packaging of another Easter themed treat sparked my memory. With a bit of poking around I found them again. Of course any eggs will do but I was smitten with these in particular! 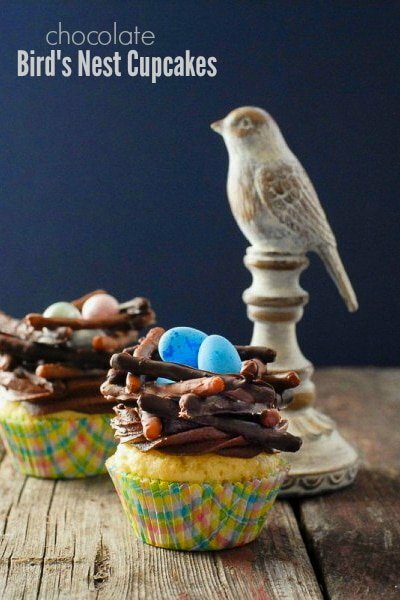 I loved the end result of these Chocolate Bird’s Nest Cupcakes. Because they needed to be gluten free I used gluten free pretzel sticks from Glutino, which I coated in melted chocolate and assembled into the nests (instructions in the recipe). If you can eat gluten, If you are able to eat gluten, chow mien noodles would be great too due to their winding shapes. I also wanted a color variation so used two types of chocolate to dip the pretzels and then assembled the nests. The nests making process is more simple if only using one type of chocolate however. 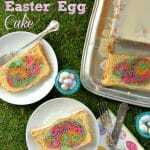 The combination of the orange-flavored cupcake, the chocolate-covered pretzel nest adding some crunchy texture and the candy eggs made this nothing less than whimsically perfect! Making the chocolate nests is a bit of a labor intensive process but the result is worth it. There are some chilling stages when assembling the nest itself and it can be done over a few days if you choose. Once the easter cupcakes are assembled, the cupcakes (those which weren’t gobbled up) stay in perfect form when refrigerated and protected (though the cupcake itself may become dry if stored too long). Dark chocolate is ‘sturdier’ than milk chocolate: meaning it takes longer to melt but also does not melt as readily when you are handling the coated pretzels. The process is messy when dipping and assembling the nest. If when handling the coated pretzels the chocolate begins to melt, don’t fret! Any exposed areas will be painted with chocolate to cover them up. Chopping a chocolate bar for melting and dipping the pretzels works better than chocolate chips. I used a gluten-free vanilla-flavored cupcake (cake) mix and flavored them withorange extract. 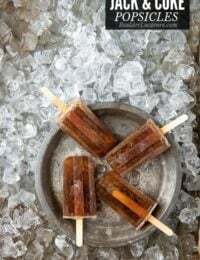 I wanted a spring flavor combination and love orange and chocolate together. Any flavor cupcake and/or frosting may be used. 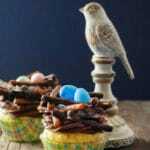 If you’ve tried this Chocolate Bird’s Nest Easter Cupcakes recipe or any other recipe on BoulderLocavore.com please don’t forget to rate the recipe and let me know where you found it in the comments below, I love hearing from you! 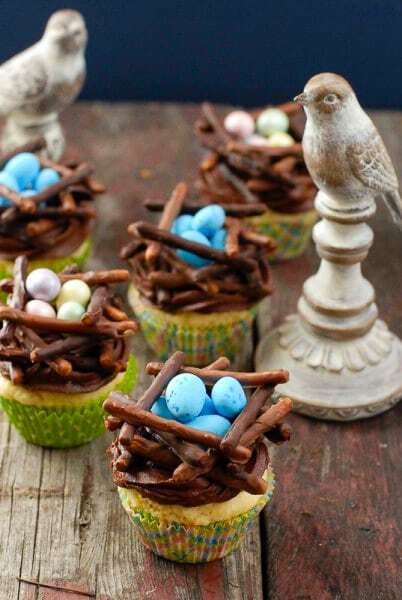 A perfect celebration of spring or Easter, these chocolate bird's nest cupcakes will delight young and old! 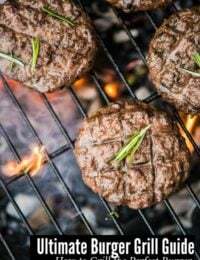 They may be made gluten-free or regular based on ingredients used. The nest a bit of time and patience to assemble but the reaction to the end result makes that completely worth it! 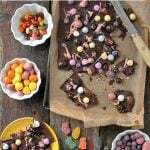 The recipe uses both dark and milk chocolate to add different colors to the nests. One type of chocolate may be used for the entire nest instead. The Recipe Time is for creating the nests and affixing them to prepared cupcakes (see NOTES for breakdown). Time does not include baking cupcakes. In a double boiler or metal bowl above gently boiling pan of water, add chocolate to melt; melt each the dark and milk chocolate separately if using both. NOTE: Chocolate can also be melted in the microwave using the 'melt' function. As chocolate is melting, line baking sheets with wax paper (dipped pretzels will be placed to harden). 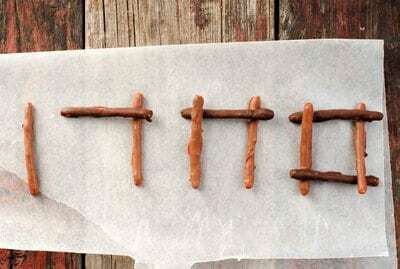 Place pretzels in melted chocolate. With a slotted spoon gently spoon chocolate over the pretzels to coat. Scoop some pretzels with the slotted spoon and gently shake the spoon over the melted chocolate to allow excess chocolate to drip back into the bowl of chocolate. 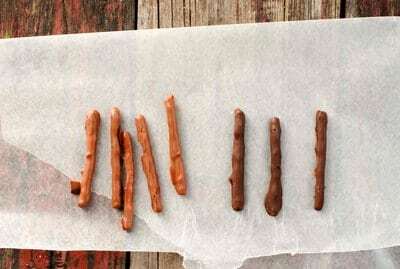 Place coated pretzels on the wax paper with room in between so they will harden individually. Keep remaining melted chocolate in double boiler or pan of water (turn heat off). It will be used again for ‘glue’ and repair when attaching the coated pretzels to make the nest. 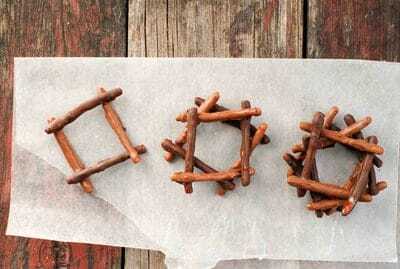 Place the baking sheet of pretzels into the refrigerator to speed hardening. Check after 10-15 minutes to see if they are hardened; remove or allow to sit longer as needed. NOTE: The nest is formed from three squares, each made of 4 pretzels. If you choose to use the 2 different types of chocolate you may incorporate the coated pretzels as desired (for color effect). Place one pretzel vertically on wax paper on a baking sheet. Select a second pretzel to cross over the first pretzel, close to the end of the first pretzel. Dip the unused craft paintbrush into the color chocolate matching the chocolate coating the second pretzel. Place a drop of the chocolate on the backside of the second pretzel where the two pretzels will attach. Place second pretzel on first pretzel, gently press down to make full contact. Allow it to dry for a few minutes before proceeding to layer on the third and fourth pretzel in the same manner. NOTE: I put one end of the pretzel over the pretzel before, and underneath the following pretzel to give more dimension (see photo). Place tray of squares into the refrigerator to harden (check after 15 minutes). Chocolate coating repair (if needed):If the chocolate has thinned out where you handled any of the pretzels paint a thin layer of chocolate over the spot to even it out. When the squares are hard and firmly attached, place one square on wax paper in a baking sheet. Take a second square and using the same ‘gluing’ method as in Step 8, dip the craft paintbrush in the chocolate to paint the spots on the back side of a second square to be placed at the angle shown in the photo. Place the second layer on all the nests and allow to sit and harden for a few minutes (this allows them to stabilize to add the final layer). Place the third and final layer on the two layered nests in the same manner, orienting the third layer in the same position as the first layer. This gives the most stability in the end. 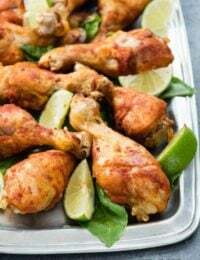 Place in the refrigerator to harden fully; about 20 minutes. You may do any repair chocolate painting if desired. Note: if wishing to do the nest and cupcake assembly on different days, be sure to cover the coated pretzels or nests with plastic wrap to prevent oxidizing (getting a bit of a powdery look). Frost the cupcakes. Gently place a nest in the middle of the top of a cupcake. Gently press downward to lodge the nest securely in the frosting. Add candy eggs and serve! The time required to make the cupcakes is more intensive while making the nests due to the in between chilling times. I suggest making the cupcakes and while they are cooling to begin making the nests. The nests take about 25 minutes for coating the pretzels and the first chill; 15-20 minutes for assembly of the squares, dependng on how many you are making, plus 15 minutes chilling time; and about 20 minutes to assemble the final nests. This is all dependent on how many you are constructing and how easily you find the construction process to be. I love Pamela’s products, they are the best! I love baking! 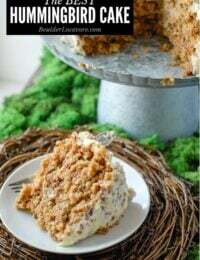 My daughter-in-law and niece are both following a GF diet, so I have been trying to do more GF baking/cooking, and your recipes and ideas are a great help. Thank you, and I look forward to future posts! I love baking!! 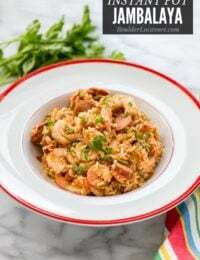 I am following you on Pinterest,so much fun ! 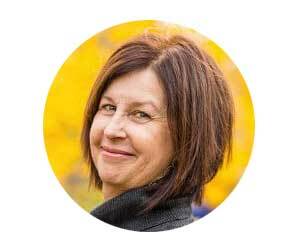 Not only do I love baking, I’m smitten about Pamela’s products! Her baking mix makes the most amazing crepes. I love baking! And I love baking with Pamela’s!! These are too cute! What a creative idea. Yes, I love baking – but even more do I love the creativity and beauty of these cupcakes. Over the top, Toni. I can only imagine how much fun they will be to EAT, too! Love this post, Toni! 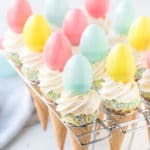 Guess what I’ll be making for Easter?! 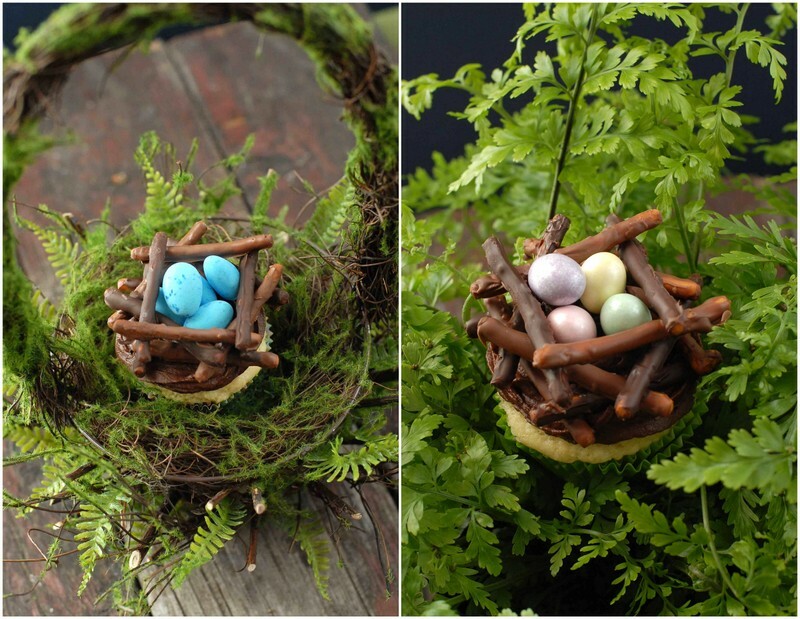 These bird nests are too cute! 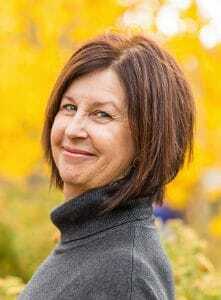 I follow Boulder Locavore on Twitter. I LOVE baking – and these are wonderfully cute & very springy!!!! I do LOVE baking: made some coconut oil banana bread yesterday and roasted garlic bread is on the agenda for today! These are so inspired! 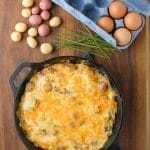 Love the hue of those eggs and your pics are amazing! I LOVE BAKING! 🙂 AND, I loooooove these cupcakes! Adorable! I love baking;:! I just hate mixing up different flour mixes for each different thing I make.what a mess.